Upcoming stealth action game Metal Gear Solid V: Ground Zeroes will be released on old and new platforms. How different will they look? 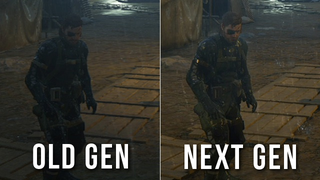 Konami released a handful of comparison images from the different versions of the game, explaining how the PS3 and PS4 versions stack up as well as the Xbox 360 and Xbox One versions. No, Konami did not release images that compared the PS4 and the Xbox One versions. However, Konami did reveal that the PS3 version runs at 720p (scaling internally) at 30 frames per second. The PS4, however, has a resolution of 1080p and a frame rate of 60fps. The Xbox 360 is 720p at 30fps, while the Xbox One version is 720p at 60fps. Compare that to the PS4 version's 1080p resolution—if that kind of thing matters to you. Well, this isn't the first game to run on 720p on the Xbox One, and it probably won't be the last!